As Venezuela get set to kick-off their 2015 Copa América campaign, Hispanospherical.com takes a look at how they may fare in Chile. Following on from a general overview, there is a more detailed summary of how the past 11 months have gone under new manager Noel Sanvicente as well as profiles on several players who could be crucial to the team’s chances. For more information on the representatives of La Vinotinto, click here for profiles on every single player in the 23-man squad as well as the coach and how he intends to set up his team. With Brazil, Colombia and Peru accompanying La Vinotinto in Group C, it is tempting to think that their chances of qualifying for the knock-out stages are largely contingent on getting a win against Los Incas and then praying for that to be enough to claim one of the two best third-placed-side spots. Indeed, while they may have finished fourth last time around and then challenged until the death for a World Cup berth, the team has struggled to gel under new manager Noel Sanvicente and appear to be under-prepared for the tournament. With the exception of Jamaica, who seem to be treating their Chilean experience as their warm-up for July’s CONCACAF Gold Cup, Venezuela are the only team not to play at least one official match in the weeks leading up to the competition. Their planned late-May friendly against Bolivia was the fifth in the past year to be cancelled and, considered in light of the recent FIFA shenanigans that implicated Venezuela FA (FVF) President Rafael Esquivel, organisational and administrative issues both on and off the field have certainly impacted upon Sanvicente’s plans. Chita (yes, cheetah), to give him his popular moniker, has overseen eight games in his 11 months in charge, yet despite also holding several training modules with home-based players, he has struggled to successfully instil his approach into his players. Indeed, the attempt to transition the side from one that soaked up pressure and then struck on counters, to a more confident, controlling team who press their opponents from the off has yet to reap dividends. Not only has the attack shown little cohesion with the team instead dependent on set-pieces, long range efforts and defensive errors for the goals they have scored (12, though 10 officially), but they have looked porous in the middle of the park as well as at the back, conceding 18 (19 officially). Furthermore, the three wins they have achieved – and in which they got 6 of their 10 official goals – have been of dubious merit, with two coming against Honduras in games contested solely by domestic players (only one or two of whom are likely to feature in a starting line-up this month) and the other occurring in a 1-0 win over an understrength Peru in the debut match of their new boss Ricardo Gareca. Watching so many players who ply their trade at relatively high club levels – including La Liga, Serie A and Ligue 1 – struggle to replicate their weekly form within Sanvicente’s system has been disheartening for the nation’s ever-growing number of football fans. The obstacles that have thwarted Chita in regularly calling up every player he would have liked for friendlies as well as the sheer diversity of leagues in which the members of the 23-man squad played last season (12, in 10 different countries and four distinct continents) may well be partly to blame for the lack of fluidity and disjointed forward forays. Nevertheless, many fans instinctively retain hope; understandable given the memories of 2011’s semi-final run as well as some of the players Sanvicente has at his disposal. Indeed, though the defence is arguably the area where the disparity between performances at club and international level has been most evident, it will nevertheless feature two of the most high-profile players in the squad. Firstly, towering centre-back Oswaldo Vizcarrondo, who played the most minutes of anyone at Nantes last year as well as regularly captaining the side and secondly, right-back Roberto Rosales, Málaga’s most used outfield player who kept group stage-rival Neymar quiet in both league encounters. Ahead of them will be arguably the team’s key man, defensive midfielder Tomás Rincón who, in his debut season since moving from Hamburg, helped play a central role in Genoa’s impressive sixth-placed finish. If Sanvicente errs on the side of caution against the likes of Brazil and Colombia, it is likely that Deportivo La Guaira’s experienced Franklin Lucena will renew the partnership with El General that was so effective in 2011. If however, he instead deploys a deep-lying playmaker – as he did for varying periods of time in both of March’s friendlies – Juan Arango, arguably the greatest Venezuelan player of all time, could well occupy this spot. Indeed, now 35 and winding down his career in Mexico with Xolos de Tijuana, it is not entirely clear if he will start but, having been moved back from a more advanced area into this position at club level, Sanvicente has also experimented recently with him here in training, so the possibility is very much there. Whoever ultimately plays alongside Rincón, likely to be in front of them in some capacity are the mobile legs of 22-year-old Josef Martínez, who showed glimpses of his clinical finishing and rapid movement in his first season for Torino. While he can play up front, he is likely to be used either slightly behind or on one of the flanks as the sole striker up top will undoubtedly be the team’s most valuable player (monetary-wise, at least). Salomón Rondón, who has recently won the Russian Premier League with Zenit St. Petersburg, may be yet to find the net in the Sanvicente era, but his height, physical power and finishing always provide fans and team-mates alike with ample reasons to feel confident when in the final third. Ultimately, Rondón and co. will all need to regain some form and hastily generate some on-field chemistry and solidity if they are to achieve anything other than squabbling with Peru like two bald men fighting over a comb. There are other players of note in the squad who could prove to be more influential than these established cracks – not least Alejandro Guerra, the returning Ronald Vargas, Luis Manuel Seijas and, possibly if he gets a chance or two, 20-year-old winger Jhon Murillo, who has recently been snapped up by Benfica. Along with every other player in the squad, they are all featured in this extensive reference guide of player profiles, some of which are relayed in the Key Players section below. However, should you choose to read on, before these, there is a more thorough overview of how The Sanvicente Era has so far panned out, starting with a reminder of the situation that the coach inherited. Four years ago in the unpredictable, online gambler-infuriating Argentina-hosted edition of this tournament, La Vinotinto were one of the leading sides to defy expectations as, enthusiastically cheered on by then-President Hugo Chávez, they embarked on a rollercoaster ride to the Semi-Finals. Although their performances had markedly improved in the preceding decade, with the Quarter-Final finish in 2007 at the time their best showing, their traditional reputation was nevertheless such that, for example, a Brazilian advertisment could still blithely mock their supposed lack of footballing prowess. However, such flippant scorn was to rebound on these particular devotees of the Seleção, as Venezuela claimed a creditable opening-day draw off them, before beating Ecuador and then, following two dramatic goals at the death against Paraguay in a 3-3 draw, securing their place in the knock-out stage. In the Quarter-Finals, Chile, who finished ahead of eventual winners Uruguay in their group, came undone against César Farías’ men, whose swashbuckling run, in turn, ended in the most heartbreaking circumstances on penalties against Paraguay. A history-making fourth placed finish was thus confirmed following a play-off loss against Peru. The boys in burgundy had done wonders to further increase the profile and popularity of football in their baseball-reared culture and were to continue to achieve some impressive results in qualifying for World Cup 2014, being in with a chance of claiming the fifth-place play-off-spot until their final matchday. He had a decent selection of players for his first two games, which occurred on September’s Asian tour and consisted of a 3-1 defeat against South Korea and a 2-2 draw with Japan (later officially overruled as a 3-0 loss; see here for more details). However, due to wanting time to bed in with his new club in Mexico, veteran icon Juan Arango omitted himself, a few other hitherto first-teamers were missing and several who have ultimately received the Copa call were quite far off a squad place back then. Following on from this, the two scheduled matches that were originally planned for October were cancelled, then rashly replaced by two more fixtures which, in turn, were then also called off. In lieu of any competitive action, some hastily arranged training sessions took place in Madrid that were almost exclusively attended by overseas-based players (goalkeeper Alain Baroja being the exception). Any tactical plans for the subsequent set of matches in November were undermined by the absences of 8-10 key players (including Venezuela’s very own three R’s: Rincón, Rondón and Rosales), which led to predictably disastrous results: a 5-0 thumping from Chile, in which Venezuela were easily overran and outflanked, then a 3-2 defeat against Bolivia, providing El Verde their first win in 21 months. Early February brought some qualified joy, as a squad consisting entirely of domestic league players chalked up two victories in a double-header against Honduras, though in light of the fact that only one or two of the starters are likely to maintain this status in Chile, these have to be considered B-level encounters. Nevertheless, with the first wins of the new era under their belt, considerable enthusiasm greeted the two late March friendlies as Sanvicente was able to call upon arguably his strongest pool of players to date. Yet, morale was to fall to a new nadir as La Vinotinto were overpowered and outpaced in a 2-1 loss away to Jamaica who, at the time of the Copa América draw in late 2014, were the lowest seeded team. The subsequent 1-0 victory against group rivals Peru went some way to restoring hope that the team would not be entirely humiliated in Chile. However, it has to be acknowledged that it was manager Ricardo Gareca’s first game at the helm and, unlike then, for the tournament he will have Claudio Pizarro (Bayern Munich) Jefferson Farfán (Schalke 04), Paolo Guerrero (Flamengo, recently signed from Corinthians) and Juan Manuel Vargas (Fiorentina) at his disposal. All the same, it was the side’s first win under Sanvicente in a game featuring the overseas contingent, as well as the first clean sheet and, particularly in the latter stages, saw them create far more chances than they had previously. Yet, the boss was to be largely denied the possibility of building upon this as firstly, for reasons known only to the FVF, a May home game was unable to be arranged. Then, amidst, and allegedly affected by, the FBI raid on FIFA that implicated FVF President Rafael Esquivel, a friendly against Bolivia in Mendoza, Argentina, was cancelled. Thus, since the Peru win, the closest thing Venezuela have had to a competitive test was a practice match against the youth team of Argentine side Godoy Cruz, which at least ended in a reassuring 5-0 bogwashing. Collectively then, the representatives of La Vinotinto go into this competition relatively under-prepared and still struggling to be accommodated effectively in Sanvicente’s bold new system. Additional training modules have been held at various points throughout the past year largely in order to indoctrinate home-based players – many of whom never had a prayer of making the final squad – into the coach’s way of thinking, but as yet, the jury is still out. Thus, with results underwhelming, the defence porous and shaky, the midfield timid and the attack playing like strangers incapable of more than a few consecutive passes, if Venezuela manage to get out of the group, it has to be considered a success. Although Sanvicente may have received much goodwill upon taking the job, if his side crashes out at the first stage and his methods still yield little discernible results several games into the upcoming World Cup Qualifying campaign, he may find himself warily looking over his shoulder. However, such dystopian scenarios are doubtless far from the players’ minds as, with at least half of the 2011 regulars likely to also start here, they will retain the conviction that being the underdog and proving people wrong are part-and-parcel of being a Venezuelan footballer in the 21st century. Below are several profiles on some of the leading names in Venezuela’s 23-man squad, as well as a couple of youngsters who could well make their mark. These profiles come from this extensive article which provides similar information on every single player in the squad as well as manager Noel Sanvicente and how he intends to set up his side. Playing in a role few schoolboys tend to daydream about emulating, defensive midfielder Tomás Rincón (27 years old) is nevertheless the most important player in this squad. Although some other previews on Venezuela have picked out striker Salomón Rondón or ageing icon Juan Arango as their key man, El General will surely be playing the lead role in determining La Vinotinto‘s fortunes. Indeed, as if to confirm this status, in the run-up to the tournament, he was officially allocated the captain’s armband, taking over from the long-serving Arango. 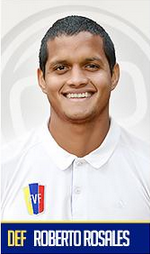 Update (14 June 2015): Despite it being widely reported in late May that Rincón would be the new permanent captain, there are lots of claims that Arango will instead retain the armband for this tournament. Nevertheless, as Rincón has been the vice-captain for some time and Arango tends not to last the distance often, even if the latter ultimately officially keeps the armband, expect to see the former wear it during the tournament and eventually take over full-time in the future. To ensure the side is not overran in the central area and to also provide additional cover for the vulnerable back four, the Genoa midfielder’s leadership and organisational qualities will be integral. While renowned more for assiduous tracking and tough tackling than searching forward passes – or, for that matter, getting anywhere near the opposition goal – he will also need to release the ball quickly for the attack to prosper. Following over five years with Hamburg, he has recently enjoyed a largely successful debut season in Serie A, finishing sixth with unfashionable Genoa and has been linked with a big move to La Liga or a return to the Bundesliga. Valencia is the strongest rumour of the several currently doing the rounds and though a repeat of 2011, when he was named the Adidas Player of the Tournament, seems a big ask, an impressive showing will certainly do him no harm. Though Nantes stalwart Oswaldo Vizcarrondo (31) can be assured of a starting place, having played in all six Sanvicente-era games he was eligible for as well as performing regularly and consistently at the highest club level of anyone at centre-back, his partner is less clear. There are four other options in this department and, given the noted issues at the back, it could very well transpire that Vizca ends the tournament having played alongside more than one of them. Thus, the leadership, organisational and renowned communication skills of this imposing, committed individual will be vital to the entire team’s chances. A towering presence in the air at both ends of the pitch, though he is far from alone amongst the back line in lacking in speed, he can nevertheless be a beacon of solidity and persistent marking – just some of the traits which saw him placed in many Best XI features after the 2011 Copa América. That he is performing so well in Europe and even regularly captaining his Ligue 1 side is all the more impressive when it is noted that it was not until 2013 at the age of 29 that he made the leap over to the Old Continent. Indeed, previously he had racked up a colourfully respectable list of Latin American clubs: Caracas (Venezuela, two spells), Rosario Central (Argentina), Olimpia (Paraguay), Once Caldas (Colombia), Deportivo Anzoátegui (Venezuela), Olimpo (Argentina), América (Mexico) and Lanús (Argentina). Following Alexander González’s omission from the final squad due to injury, not only have commentators been deprived of regaling viewers with the story of him proposing to his girlfriend on the pitch, but Sanvicente now only has one natural right-back to choose from. However, as this is first-choice Roberto Rosales (26) – who has just completed a fine debut season in La Liga with Málaga – so long as he does not get sidelined, there should not be too much to concern in this patch of the field. Since making the step up last year from FC Twente, he has proved to be more than capable of maintaining his close-tracking and tenacious tackling approach in his top-half Spanish side. Though the nature of his club’s style and the forwards at their disposal may be why his regular, pacy forays up the flank have only yielded three assists (which, nevertheless, put him third overall for the season just gone), in open play at least, he certainly adds more than his international defensive colleagues do in this department. More pertinently to the group stage, in both league games against Barcelona, he was able to keep Brazil’s golden boy Neymar quiet, firstly in a 0-0 home draw and, most impressively, a 1-0 away win at Camp Nou. Largely influenced by this second performance, he was subsequently named in La Liga’s February Team of the Month. Quite how he will fare in a markedly different back line is less certain, particularly as none of the likely starters who have impressed at club level have been able to replicate their form internationally under Sanvicente. A role which may or may not be utilised, a deep-lying playmaker was nevertheless experimented with in March’s two friendlies as well as, more pertinently, in training sessions leading up to the tournament. Juan Arango, now 35 and understandably slowing down, is the most likely candidate if this position is ultimately given the green light. Indeed, though the free-kick maestro and scorer of almost exclusively sensational goals made his name in Spain and Germany with more of an attacking licence – centrally as well as on the left – he became accustomed to this role at club level in the season that has just passed. Having returned last year to Mexico where he played before he made the transition to Europe back in 2004, while his current club Xolos de Tijuana had an underwhelming campaign, he gradually came to flourish in this less energy-sapping placement, particularly in the league’s second half (the Torneo Clausura). Overall in Liga MX, he scored nine goals and officially received credit for six assists, though his inviting crosses, corners and free-kicks certainly played a prominent role in at least a few more. Playing in his sixth Copa América, though he may not be the same player who spearheaded the history-making 2007 Quarter-Final finish and who was later named in most observers’ 2011 Best XI of the Tournament pieces, his pin-point long-range passes could still be vital this time around. Although a place in the line-up can not be entirely guaranteed, he has played in all four games that he has been available for under Sanvicente (starting three and making a strong impression when he came on against Peru). If he starts but in another position, reprising a more forward role behind the striker or on the left are certainly possibilities. Update (13 June 2015): On the eve of the opening game, it has been reported that in a slightly altered team that has been practising in training which has two personnel changes to the one previously observed, Arango has been playing as the left-sided attacker, with Luis Manuel Seijas instead as the deep-lying playmaker. If Arango does start off the tournament on the left, there is nevertheless a strong chance that he may drift back to beside Rincón at some point. It will be of possibly painful intrigue to see if his legs are still up to a more forward position. Lastly, while it may not have made as many headlines as a certain incident involving Luis Suárez, Arango was guilty of biting an opponent at the end of a Mexican league match in early April, for which he was merely banned for two domestic encounters. Should Venezuela meet Uruguay in the latter stages – a possible, if not the likeliest, scenario – expect to hear more about this. 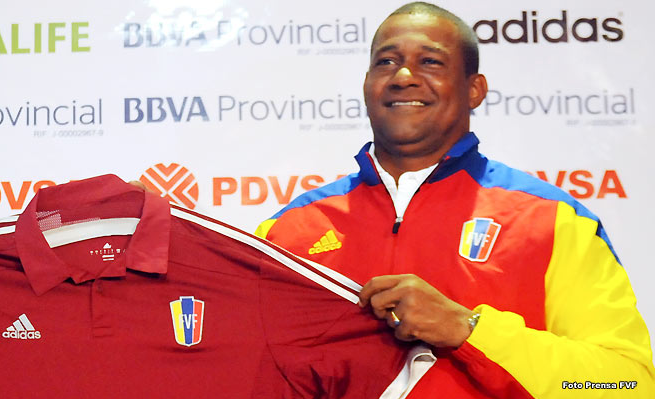 Salomón Rondón (25), the most expensive Venezuelan of all time, is considered by many as the team’s main man up top. Understandable, given that in the season just gone he played in both major European club competitions and ended it as champion and joint-second top-scorer of the Russian Premier League. However, internationally, his success is largely dependent on the service provided by those behind him – something that has been frustratingly lacking in the past year, as he has not managed to score in any of his four outings, often appearing anonymous. When he has received chances, he has at times lacked composure and direction. Furthermore, though he may have only been 21 four years ago at Copa América 2011, he did come into the tournament with a domestic scoring rate of one in two in his debut season at Málaga and so subsequently featured in all six of his country’s games (three starts), but scored just the once. While he does have an important role to play and will be looking to use his height to spring onto the end of balls coming into the area as well as be on his toes finish off chances, it can be easy to overstate his significance to this team. Indeed, as he is more of a penalty-box predator who usually plays little role in the build-up, it is the players behind him who will be particularly crucial if he is to prosper. If he receives the requisite supply – and it is a big if, given the noted issues the attacking midfield players have had linking up effectively – then it should be a morale booster for the team. All the same, expect any goals that may or may not be scored to be spread around the side, rather than gobbled up by one individual. The tournament could potentially be a great opportunity for Rondón to put himself in the shop window, as the talk emanating out of Zenit St Petersburg for the past several months has been that manager André Villas-Boas is seeking to offload him. Further fuelling the rumours, the player has commented more than once that he fancies trying his luck in England or Germany, though would not be averse to a return to Spain either. Media reports have dutifully obliged, with stories published linking him to, among others, Tottenham, Liverpool, Wolfsburg and Sevilla. While he may struggle to shine in such a tough group when Venezuela may often be on the back foot, the presence of such a relatively high calibre striker up top ensures that those behind know, that if they can just play the right ball forward, the team will always have a chance. If, as is being suggested by reports, neither Luis Manuel Seijas nor Juan Arango is fielded on the left of midfield in the opening game, there are several other contenders in the frame. According to how the side has been training, Torino’s Josef Martínez (22) appears to be the likeliest candidate to start, despite being more regularly deployed at club level just behind the striker. Indeed, he can also play as the front man and if there are any problems with Salomón Rondón up top, he could well be pushed forward to step in. Update (13 June 2015): As noted in the Arango profile, according to a new, slightly altered line-up tried in training, Arango may instead start on the left against Colombia. Whatever transpires, expect to see Martínez at some point in the tournament. Although, following a two-and-a-half year spell in Switzerland and a debut year in Turin, he now has a full Serie A season as well as Europa League experience with two different clubs under his belt, he still just about qualifies as being off the radar of most fans of top-level European football. With this being his first Copa América, he has the opportunity to showcase his abilities to new and larger audiences. Wherever he ends up playing on the pitch, in contrast to Jhon Murillo – who has been designated in several preview articles as Venezuela’s top young prospect despite only ever making one substitute appearance for his country – he has significantly more chance of starting at least one game. For this reason more than any other, he must be considered as his nation’s leading young player to look out for. However, if he does shine, rather than gaining a bigger move, it is more likely to be beneficial for his chances at club level as while in 2014-15 he featured in 26 league, one cup and 13 European clashes – scoring seven goals along the way – he did not last the course in over half of these. Internationally, he is far from alone under Sanvicente in not having the most glorious of times in the past year but he did look particularly sharp when coming on as a substitute against Jamaica and, subsequently, scoring the winner against Peru. As a very mobile player, capable of rapid movements and turns, as well as clinical and long-range strikes, who can also provide support to other attackers, he has much to offer the team. Though he is not likely to start in the opening game, Jhon Murillo, who must be on cloud nine having recently turned 20 and signed for Benfica from Zamora, stands a fair chance of entering the fray at some point – if only as an impact substitute. Presumably due to this potentially life-changing move as well as there being no other young attacking player in the squad who has not already played for a European club, he has been singled out in many preview features as Venezuela’s hot prospect to watch. Maybe. He has, after all, reportedly impressed Arango in training, knows Sanvicente well from when the coach was at Zamora (2012-14) and, given the chance, will delight in aggressively running at defenders and pouncing on any hesitancy. However, with so much competition in the attacking midfield positions and the fact that he has only previously been called up for one game – the second against Honduras in February in which, due to a defensive mix-up, he capitalised to score 37 seconds into his debut – one wonders if it is all a bit too much, too soon. Indeed, he has done remarkably well in his early club career, making his Zamora debut under Chita at the end of the 2012-13 campaign, before scoring an impressive 19 goals in 54 league games (all starts) in the subsequent two seasons while playing on the right wing as well as, at times, more centrally. He was also his now ex-club’s leading threat this year in their otherwise dismal Libertadores campaign, scoring twice in four games. However, he was also red-carded in the opening game, seemingly for comments made towards – or at least in front of – the referee and it is this worrisome temperament of his that could well hold him back in the long run. Indeed, while he was also the Venezuela U20 side’s best attacking player in January’s Sudamericano Sub-20 tournament, his antics at the very end of the final group game are further testimony to his volatile nature. Against hosts Uruguay, following a relentless verbal and even physical reprimanding of the referee, he played a leading role in getting the official – who, it must be noted, had riot police at his disposal – to reverse his decision on a legitimate opposition goal, securing for Venezuela the 1-0 win. Not entirely for his appearance and haircut then has he been nicknamed ‘Balotelli’ (though, in fairness, the Venezuelan is at least significantly more consistent on the pitch). Furthermore, while he will not be regretting it now, it is believed that his attitude during a trial at Basel in 2014 cost him a move to the Swiss giants. Ultimately, whether or not he gets many opportunities in the next month, one can only hope that the experience of being around long-standing high calibre professionals will inject a little more humility and maturity into this otherwise exciting prospect. As noted above, to read similar profiles about the entire squad, click here. Alain Baroja (Caracas FC), Wuilker Fariñez (Caracas FC) & Dani Hernández (Tenerife). Fernando Amorebieta (Fulham, ended season on loan to Middlesbrough), Wilker Ángel (Deportivo Táchira), Gabriel Cichero (FC Sion, ended season on loan to Mineros de Guayana), Grenddy Perozo (Ajaccio), Roberto Rosales (Málaga), Andrés Túñez (Buriram United) & Oswaldo Vizcarrondo (Nantes). Rafael Acosta (Mineros de Guayana), Juan Arango (Xolos de Tijuana), César González (Deportivo Táchira), Alejandro Guerra (Mineros de Guayana, ended season on loan to Atlético Nacional), Franklin Lucena (Deportivo La Guaira), Jhon Murillo (Benfica, signed recently from Zamora FC), Tomás Rincón (Genoa), Luis Manuel Seijas (Independiente Santa Fe) & Ronald Vargas (AEK Athens, signed recently from Balıkesirspor). Nicolás ‘Miku’ Fedor (Rayo Vallecano), Josef Martínez (Torino), Gelmin Rivas (Deportivo Táchira) & Salomón Rondón (Zenit St. Petersburg). One last time, to find out more about these players and to get a more precise idea of where and how they play, please take a look at this detailed set of profiles of all 23 members of the squad. Otherwise, thank you for reading and stay tuned for more Copa América coverage in the upcoming weeks on Hispanospherical.com. 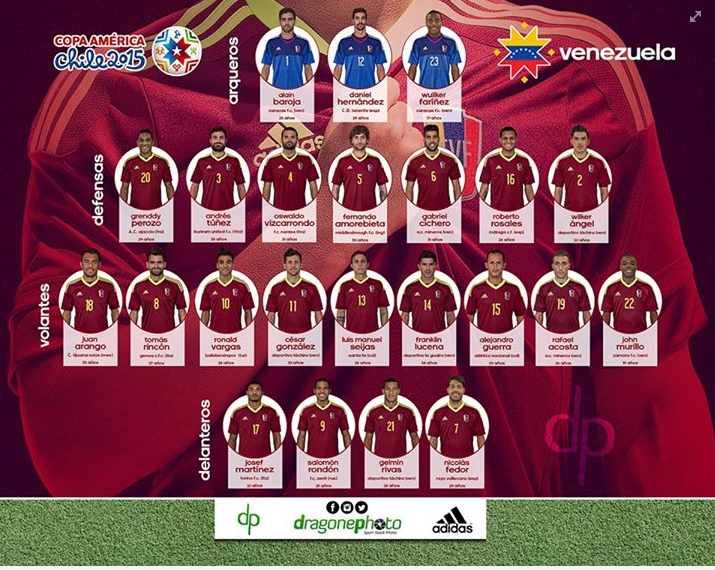 This entry was posted in Venezuela National Team and tagged Alain Baroja, Alejandro Guerra, Andres Túñez, Brazil, César González, Colombia, Copa América, Copa América 2015, Copa América Group C, Dani Hernández, Fernando Amorebieta, Franklin Lucena, Gabriel Cichero, Gelmin Rivas, Grenddy Perozo, Jhon Murillo, Josef Martínez, Juan Arango, La Vinotinto, Luis Manuel Seijas, Miku, Noel Sanvicente, Oswaldo Vizcarrondo, Peru, Rafael Acosta, Roberto Rosales, Ronald Vargas, Salomón Rondón, Tomas Rincón, Venezuela, Wilker Ángel, Wuilker Fariñez on June 12, 2015 by hispanospherical.